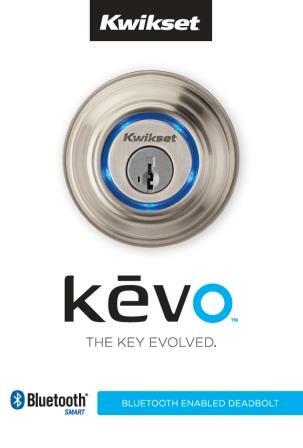 With Kevo, your Smartphone is now your key. No more fumbling for your keys. Keep your phone in your pocket or purse and just touch the lock to open. No Smartphone? No Problem. Enjoy the same touch to open convenience with the fob. 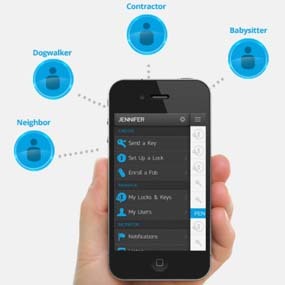 Positioning Technology: Kevo can determine if you are inside or outside the door to help prevent unauthorized entry. Mobile App Convenience: manage lock and eKeys from the mobile web app. Receive notifications and view history of lock activity. 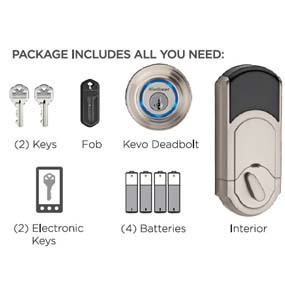 Kevo is only compatible with smartphones that support Bluetooth Smart Ready/Bluetooth 4.0 hardware AND have the available Kevo app installed. The app is currently only available for iPhone 4S, 5, 5C & 5S as well as the fifth generation iPod touch, third generation or higher iPad and iPad mini. No Smart Phone? No problem, enjoy the same touch to open convenience with the key fob.